Take the road less traveled. Walk the Tracks Across the Sky at the amazing engineering marvel, the Kinzua Sky Walk. Enjoy spectacular fall foliage tours; hands-on, experiential educational and heritage tours; food & wine culinary adventures. For active groups – guided nature hikes. In the Allegheny National Forest Region Fall really is bigger! For groups touring the Allegheny National Forest in northern Pennsylvania and nearby southwestern New York, our region offers inexpensive attractions and a selection of locally owned restaurants, choice of hotels, and one-of-a-kind venues. Below are a few suggested attractions that welcome group tours. Call 800-473-9370, ask for Linda for personalized tour assistance, or e-mail devlin@visitANF.com. School & Group programming available. The Kinzua Sky Walk is constructed on the restored towers of the historic Kinzua Viaduct, once the longest and highest railroad viaduct in the world. This pedestrian walkway extends 600 feet out into the Kinzua Gorge and features an octagon shaped overlook, with a partial glass floor, that provides stunning 8-mile forest vistas. Fall Foliage – Longhouse National Scenic Byway – USA Today, 2011, named as one of top 50 scenic drives in the United States – Prime color during first two weeks of October. Scenic Route 6 – Small Town Charm. Recommended sites to visit locally: Allegheny National Forest, Flickerwood Wine Cellars, Allegheny Cellars Winery, Artworks at the Depot, Kane Manor, Olmsted Manor, Smethport Mansion District, Old Jail Museum, Route 6 Diner, Barrel House Restaurant. Designed to attract visitors of all age groups, tours will be customized to the age and interest of your group. Highlights include a M255 tank, a working submarine periscope, interactive exhibits, and the Gallery of Valor. Bring your group on a free tour to a location that celebrates “Made in America”. Home of two American icons — the Zippo lighter and the Case knife. The Zippo/Case Museum features world-class interactive exhibits, an extraordinary 7’x 11’ American flag comprised of 3,393 red, white and blue lighters, and the famous Zippo Repair Clinic where the Zippo lifetime guarantee is fulfilled. City of Bradford – Bradford’s National Historic District offers the eclectic architecture built by the early Oil Barons during the first discovery period of Pennsylvania oil in the late 1800’s. A variety of charming shops and locally owned restaurants are within walking distance of Main Street. John Williams European Bake Shop offers “Baking with Joe” a hands-on culinary experience for groups. Nearby is Crook Farm, an 1800s restored farm with one-room school house, blacksmith shop, and original farm house. Hear the “Wild Catting Tales” at the site of our 72 foot tall, 1890 Era Standard Rig. You can experience the excitement of the FIRST billion-dollar oil field. Guided tours by oil country veterans. See yellow dogs and barkers, headache posts, hurry-up sticks, and sucker rods — all used to produce that “miracle molecule” of oil found in Pennsylvania. 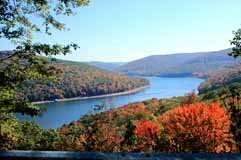 For additional itineraries or personalized service in planning your group tour to the Allegheny National Forest Region, please call 800-473-9370 or email devlin@visitANF.com.